Its Christmas Day tomorrow which is a family day so no sitting in front of the computer for long periods of time, I have to be sociable and join in the family fun. Normal service will resume in a few days time although I am sure you will excuse me if posts are not as frequent over the Christmas period. I hope you all have a great Christmas and get what you want from Santa (I'm getting a new PC and Camera, but its got to wait till January...). Finally, just taking a look at yesterdays twitter activity from both Citybus and First you can get a flavour of just how difficult conditions have been for everyone trying to run a bus service. Big thanks therefore to the bus companies who have made a sterling effort in keeping as many services running as possible, and of course a big thank you to all the bus drivers who have had the job of transporting customers across Plymouth on extremely icy roads. We have seen an extremely nasty accident in Cornwall where two passengers have died, and lots of 'minor' traffic accidents including a Citybus taking out several parked cars as it slid on ice at Keyham, thankfully no injuries on that one. I am sure all bus drivers will be looking forward to a couple days break even more than usual this year! Adverse weather update - Service 93 in South Devon is severely disrupted due to ice and is not serving Aveton Gifford. Sevice 26 unable to serve Yellowtor Road, the business park and Pillmere estate in Saltash due to icy roads. Services 8, 9 and 22 are back to normal. Thank you for your patience. We are trying to find out if the roads in Saltash are now open. Apologies for the delays with this update. Services are now back to normal in Saltash Thank you for your patience. The improved weather forecast should help us to improve reliability. We are having problems in Loosleigh Lane, Yeomans Way, Holly Park, St Pancras Avenue and Yellowtor Road. It looks like the icy weather has not left us yet. Buses are unable to operate in these areas and will continue to be unable to do so until the roads are gritted. I'm afraid to say things are getting worse. We can no longer serve Keswick Crescent, Weston Mill, Chaucer Way, and Cobbitt Road. Our bus has just followed the gritter around Holmwood Avenue, the spinner on the lorry was working but no grit was coming out - very useful. If this continues we will have very few buses left running tonight. Check out this page tomorrow morning for updates on route problems and other operational news. We will do all we can to operate our buses but we will not jeopardise the safety of our customers or staff. 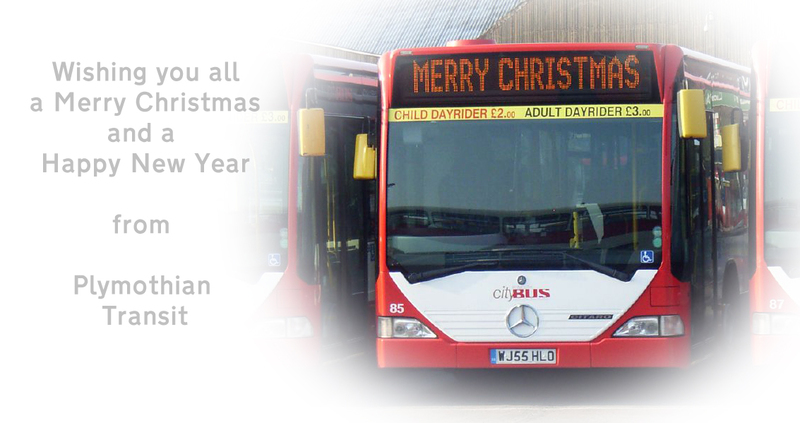 Thank you for supporting Plymouth Citybus. Buses on services 46 and 47 are now unable to access the rear of the ASDA store in Estover. Happy Christmas and a prosperous New Year to you and your family. Thank you for all the news during 2009.